The Dallas Wings will end preseason action this weekend when they host the Las Vegas Aces, tomorrow at 2 p.m. The Wings are 1-1 in preseason play, and look to finalize their 12-man roster this week before heading to Phoenix to face the Mercury for their 2018 season opener. 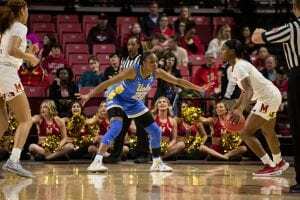 The Dallas Wings will round out their final preseason game of their 2018 campaign when they host the Las Vegas Aces at home, Sunday, May 13. 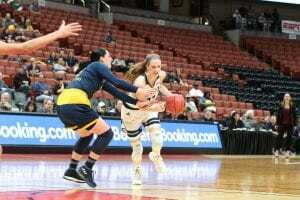 Last week, the team travelled east and faced the New York Liberty and Connecticut Sun in a tournament-style play, defeating the Liberty 76-69 in their first game. 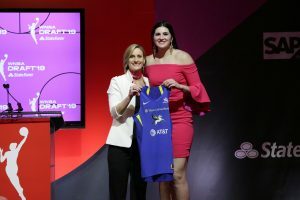 2018 first round selection Azurà led the way recording 19 points and nine boards. The Wings were also led by sophomore Kaela Davis, who brought in seven points, five rebounds and two assists. In game two, the Wings fell short to the Sun, 79-58. 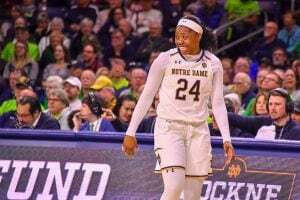 Davis continued her hot streak leading the team with 12 points, while Liz Cambage took over the court leading the way in total boards for the team with nine. Cambage also registered 11 points and two blocked shots. On February 26, 2018, Liz Cambage, one of the top centers in international women’s basketball, named Dallas her new home after signing a multi-year contract with the Wings. Cambage returns after playing in the WNBA with the then Tulsa Shock for two seasons (2011 & 2013). In Tulsa, Cambage registered record breaking numbers with an overall career average of 13.3 points and 6.1 rebounds per game… She also shot over 50 percent from the field and over 75% behind the free throw line. This past WNBL season, the 26-year-old Cambage finished as the top scorer in the league while playing for her hometown Deakin Melbourne Boomers. She averaged 23.1 points and 10.5 rebounds per game while leading the Boomers to the WNBL Grand Final Series. This year’s squad brings in a talented veteran staff led by three time all-star guard Skylar Diggins-Smith, who led the team in both scoring and minutes, with an average of 15.4 points and 34.2 minutes per game… Returning alongside Diggins-Smith is 8-year veteran and co-captain Karima Christmas-Kelly, who started all 34 games a season ago and recorded a career-high 27 points on May 25 against San Antonio… Forward Glory Johnson returns for her sixth season, after finishing fifth in the WNBA in rebounds and posting 13 double-doubles a season ago… Another returning veteran for the Wings is forward Theresa Plaisance, who played in all 34 games, averaging 7.7 points and 4.3 rebounds, while earning 25 starts in 2017. Plaisance is recovering from an ACL injury she suffered in October while playing in the Polish Basketball League. With other key players returning to the squad, including five second-year players, the team returns more than just veteran talent… Rising star Allisha Gray is back for her sophomore season, after starting all 34 games, averaging 13.0 points and taking home the 2017 Rookie of the Year… Guard/Forward Kaela Davis returns after averaging 6.1 points per game and joining Allisha Gray on the 2017 All-Rookie Team… Guard Saniya Chong played in 33 of 34 games her rookie season, averaging 2.7 points… Center Breanna Lewis saw action in 13 games as a rookie, notching a career-high in points on 5/27 in Phoenix with three… Forward Evelyn Akhator played in 15 games as a rookie and scored her first WNBA points on 5/27 in Phoenix… Also returning is Forward Kayla Thornton who made tremendous progress since signing with the Wings before the 2017 season in which she averaged 6.8 points and played in all 34 games… Returning for her third season is guard Aerial Powers, who sat out most of the 2017 season with a hip injury but averaged 10.8 points in the 12 games she played in. With one week remaining for training camp, the Wings recently waived 2018 second round pick Loryn Goodwin out of Oklahoma State and 2018 third round selection Natalie Bulter of George Mason. The Wings look to finalize their roster in the next few days, before heading to Phoenix and open their 2018 campaign.